Men’s and women’s handball events together achieve total cumulative television audience in excess of 1.5 billion. Zug, Switzerland, 26 February 2008 – The television results of the 2008 Women’s European Handball Championship, which took place in FYR Macedonia (Skopje / Ohrid) from 2 – 14 December 2008, have just been published by Infront Sports & Media, the exclusive marketing partner of the EHF EURO. They round off what has been the most successful year in the history of the EHF’s flagship event. The latest men’s and women’s events together have achieved a total cumulative television audience in excess of 1.5 billion, which is an all-time record for the events. 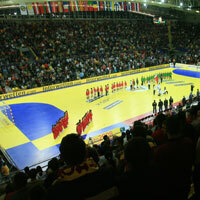 The 2008 men’s event had more than 1.2 billion viewers, which also set a record for a single EHF EURO event. The women’s event reached a cumulative viewing audience of 352 million – slightly down from 2006 due to specific factors relating to viewing in France (the French team dropped out after first round) and Poland (the team failed to qualify). However, this is the third best result in the history of the event and the duration of the broadcasts increased substantially to a new record figure of 884 programme hours, a plus of over 75 percent against the 503 hours for the comparable 2006 EHF EURO in Sweden. In particular, programme hours were sharply up in many of the key handball markets, such as Hungary (over 500 percent, up from 13.13 hours to 80.12 hours) and Norway (more than 120 percent, up from 47 hours to 106.43 hours). There was television coverage in 65 countries, mostly in Europe for obvious reasons, but also in the Middle East and South America and worldwide through news access. In the Middle East, Dubai Sports Channel covered 26 matches (plus repeats) in 23 territories of the region. The broadcast report is based on an independent programme analysis, including information provided by broadcast partners worldwide. The report was again compiled by the German communication research agency Sport+Markt AG on behalf of Infront. The sponsorship hierarchy was consistent with the last event: Eight Official Sponsors; eight Official Suppliers and a number of EHF partners. A full line-up of sponsors is a considerable achievement in the current economic climate. Interwetten (Austria), already a partner of the EHF, signed up for the first time as a full sponsor of the European Handball Championship. Other Official Sponsors included Intersport (Sports retailing, Switzerland), Konica Minolta (Copies and document solutions, Japan), AJ / Ojega (Home and office furniture; Sweden), Grundfos (Pump solutions, Denmark), Cimber Air (Airline, Denmark), Bring (Postal Services, Norway) and Dekk Partner (Tyre Retailer, Norway). Infront Sports & Media’s longstanding partnership with the EHF dates back to 1993, when the Swiss-based sports marketing group took over the responsibility for both the television distribution and marketing of the European Handball Championship events on a worldwide basis. In June 2007 the EHF and Infront signed an exclusive agreement extending their existing marketing partnership to cover two Men's and two Women's EHF Euro between 2011 and 2015. Infront is now also handling media rights to the qualification matches of the competition.